Each Rembrandt watercolor uses the purest quality of pigments and gum Arabic. It is formulated to achieve the maximum transparency and reflection of light while maintaining the highest concentration of pigment. All colors are highly permanent. Nickel Azo Yellow is a transparent, moderately staining yellow pigment with high tinting strength. It is considered a good color match in botanical and landscape painting for natural gamboge (NY24), a historic yellow pigment with fair to poor lightfastness. Nickel azomethine yellow has excellent lightfastness. Nickel azo yellow pigment is mildly toxic, and is often labeled as hazardous. Avoid respiratory and skin exposure to pigment dust. It should be disposed of properly with other hazardous wastes, not washed down the sink. However, the contribution of artist pigments to levels of nickel metal complexes in the environment is almost insignificant. Nickel is often present in the environment naturally. Nickel is used heavily in steelmaking, and in many industrial processes and products. Nickel azomethine yellow has been developed as an artist pigment becasue it is a close match for gamboge, a historic yellow. Quinacridone Gold is a high performance pigment. It lacks brightness and cleanliness in tints, and it may disperse unevenly. It has an average drying time. Quinacridone pigments have relatively low tinting strength in general. For this reason, quinacridone colors are often expensive, because more pigment is required in the formulation. 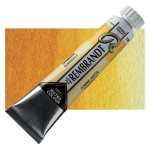 Quinacridone Gold has excellent lightfastness and is considered the most lightfast pigment in its shade range. Quinacridone gold is not considered toxic. Overexposure to quinacridone pigments may cause skin irritation. Quinicridone pigments contain a compound found to be a skin, eye, and respiratory irritant. Although quinacridone compounds became known in the late 19th century, methods of manufacturing so as to make them practical for use as commercial pigments did not begin until the 1950s. Quinacridone pigments were first developed as coatings for the automotive industry, but were quickly adopted by artists.